Last year, campers took us to a fairytale land with Belle and her magical friends in Disney's Beauty and the Beast Jr. This year, we'll transport you from the Jungle of Nool to the Circus McGurkus. 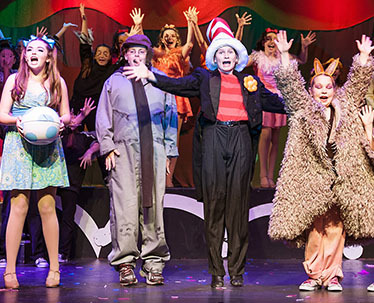 Seussical Jr. is a fantastic musical extravaganza. The Cat in the Hat narrates the story of Horton the Elephant, who discovers a speck of dust containing tiny people called the Whos. High energy, fun for all participants, and great roles for boys and girls. 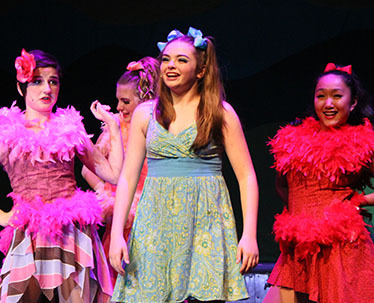 Campers will perform on the mainstage. This production will include professional set pieces, props, costumes and special effects! Our summer production staff is comprised of theater professionals. Attend both June & July camps and receive a $25 discount. The interest and enthusiasm about this summer's camp is already buzzing! Last year's camps filled completely, so reserve your spot today!